The following list is managed by our Managing Editor. It consists of titles of releases that are “in the queue” for publishing. This spreadsheet is hidden from non-members. 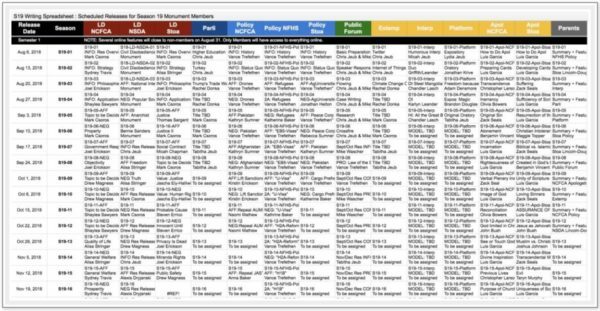 It is quite the dynamic spreadsheet that connects directly with our Monument Author assignments. When we assign a writer to a release, that release automatically publishes to this spreadsheet. As a Monument Member, you can have a look ahead to see what’s coming. The following are direct links to all member pages for each event. The downloads are on the pages you visit. Resolved: The United States Federal Government should substantially reform its foreign policy regarding international terrorism. Resolved:The United States federal government should substantially reduce its restrictions on legal immigration to the United States. Resolved: Criminal procedure should value truth-seeking over individual privacy. Apologetics will be separated in Season 19 to this NCFCA-only source material. Apologetics will be separated in Season 19 to this Stoa-only source material. NCFCA: "Resolved: The United States Federal Government should substantially reform its foreign policy regarding international terrorism." NFHS: "Resolved: The United States federal government should substantially reduce its restrictions on legal immigration to the United States." NFHS Season 20 Announced! "Resolved: The United States federal government should substantially reduce Direct Commercial Sales and/or Foreign Military Sales of arms from the United States." Stoa: "Resolved: The United States federal government should substantially reform its foreign aid." NCFCA: "Resolved: When in conflict, governments should value fair trade above free trade." Sept/Oct Novice: "Resolved: Civil disobedience in a democracy is morally justified." Sept/Oct Varsity: "Resolved: In the United States, reporters ought to have the right to protect the identity of confidential sources." NOTE: Monument guarantees releases through the Sep/Oct resolution, but may include materials if resolutions overlap with archives or other debate formats. Nov/Dec: "Resolved: In a democracy, the public’s right to know ought to be valued above the right to privacy of candidates for public office." Jan/Feb 2019: "Resolved: The United States ought not provide military aid to authoritarian regimes." Mar/Apr 2019: "Resolved: The illegal use of drugs ought to be treated as a matter of public health, not of criminal justice." Nationals: Releases May 1, 2019. Stoa: "Resolved: Criminal procedure should value truth-seeking over individual privacy." NSDA Sept/Oct: "Resolved: The United States should accede to the United Nations Convention on the Law of the Sea without reservations." NOTE: Monument guarantees releases for the Sept/Oct resolution, but may include materials if resolutions overlap with archives or other debate formats. We will continue to post resolutions as they are announced. NSDA Nov/Dec: "Resolved: The United States federal government should impose price controls on the pharmaceutical industry." NSDA Jan: "Resolved: The United States federal government should prioritize reducing the federal debt over promoting economic growth." NSDA Feb: "Resolved: The United States should end its arms sales to Saudi Arabia." NSDA Mar: "Resolved: The United States should promote the development of market rate housing in urban neighborhoods." NSDA Apr: "Resolved: The United Nations should grant India permanent membership on the Security Council." NSDA Nationals: Releases May 1, 2019. REGISTER TODAY to get access to weekly releases for speakers and debaters throughout the year. If you’re already a Member, LOG IN.